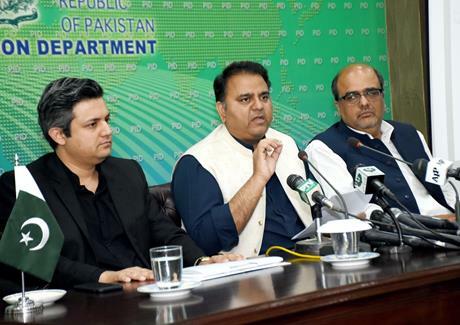 Information Minister Chaudhary Fawad Hussain has expressed hope that looted money of corrupt politicians will be brought back from abroad. Addressing a news conference along with Minister of State for Revenue Hammad Azhar and Special Assistant to Prime Minister on Accountability Shahzad Akbar in Islamabad this afternoon, he said the corruption has led to inflation, falling exchange rate of Pakistan rupee, and all sorts of issues faced by Pakistanis abroad. The Minister said Sharif family introduced Economic Reform Act in 1992 to keep the source of capital hidden. He said it was found out that in late 1990s the Hudaibiya Paper Mills was involved in large suspicious transactions. He said the former Finance Minister Ishaq Dar introduced money laundering in the country, and he himself confessed his role in these transactions. Chaudhry Fawad Hussain said a very small capital of the laundered money has been brought to Pakistan by the Sharif family and the rest is still abroad. He said Zardari set up an account of fake accounts in Sindh. Minister for Information while replying to a question said Prime Minister Imran Khan is committed to rid the country of the menace of corruption and he is supported by the whole nation in this task.